ARTIFACT COLLECTING IS NOT ALLOWED AT THE SITE OF THORNHILL!!! THIS IS A PROTECTED ARCHAEOLOGICAL AND HISTORICAL SITE!!!! PLEASE RESPECT AND PROTECT CULTURAL RESOURCES!!! 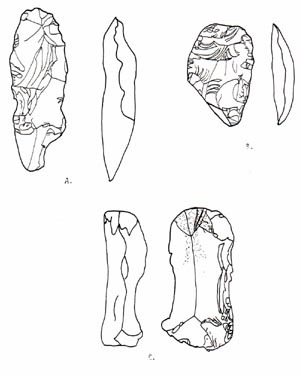 Top illustration: Some of the stone tools excavated from the interior of the Mississippian Period house at 23SL220. Enlarged image of stone artifacts from inside the house at 23SL220. Enlarged image of pottery sherds from inside the house at 23SL220. 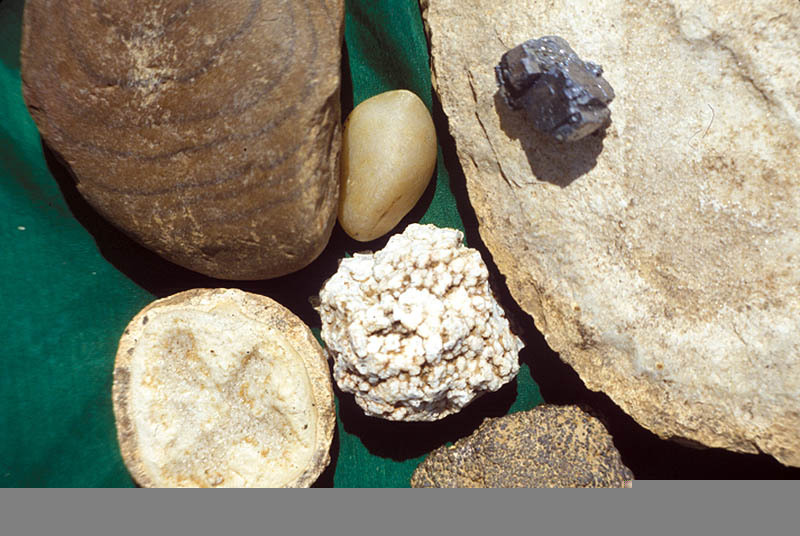 The following artifacts show the range and variation in material culture ranging from the Dalton Period through the Mississippian Period. Dalton point reworked into a hafted end scraper. It was discovered in the southeast corner of the Mississippian house in excavation unit N110 E88 (Specimen 81-2033-273-1). The hafted portion of the Dalton point are smooth from intentional grinding; the base of the point is thinned by careful flaking. The manufacture of the Dalton Point probably dates to approximately 8000 BC. It appears to have been discovered and recycled during the Mississippian Period. Length = 3.0 cm, Width = 3.4 cm. Thickness = 0.65 cm. and Weight = 7.9 grams. Agate Basin Lanceolate projectile point (Specimen 81-2033-301-surface) found approximately 100 hundred meters from the burnt Mississippian house feature. Associated with the Early Archaic Period in Missouri and Illinois (7000 to 5000 BC). This example has lateral grinding in the area of the haft and traces of blade edge serration. The blade edge is bevelled. Length = 8.3 cm, Width = 2.3 cm, Thickness = 0.9 cm. Early Archaic forms discovered in the test units near the Bates Cemetery. 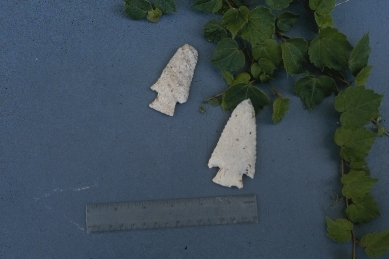 The left example is a Hardin Barbed projectile point and the right example shares traits with both Hardin Barbed and St. Charles project points. Broken side-notched dart point (Specimen 81-2033-216-1) from the area approximately 100 meters south of the burnt Mississippian house. This heat treated biface probably belongs to a Middle Archaic Period (5000 - 3000 BC) occupation of the site. Length = 3.7 cm, Width = 1.5 cm, Thickness = 0.65 cm. 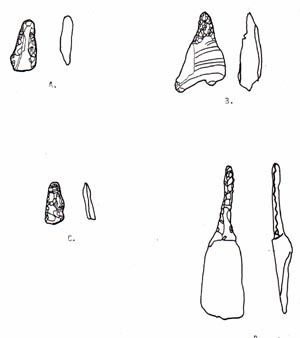 Line drawings of the large projectile points of Archaic and Woodland Period date that may have been reused during the Mississippian Period. (A) Steuben point, (B) Marshall point, (C) Gary or Langtry point, and (D) Stone County Square Stemmed base. 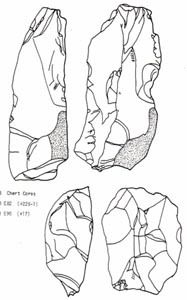 Gary point (Specimen 81-2033-235-1) from the area immediately outside of the west wall of the Mississippian house. The artifact has not been retouched. This point type is typical of the Woodland Period. Length = 3.8 cm, Width = 4.3 cm, Thicness = 0.92 cm, and Weight = 15.6 grams. Steuben-like point (Specimen 81-2033-48-1) discovered against the east wall on the inside of the Mississippian house in excavation unit N112 E90. The edge of the point is fractured and not retouched. The size of the artifact suggests is typical of an atlatl dart point and it was originally manufactured in Woodland Period. Length = 2.6 cm, Width = 1.9 cm, Thickness = 0.9 cm, and Weight = 4.7 grams. Steuben-like point (Specimen 81-2033-F-292-1) discovered in the north half of the fill of a trashpit against the west wall of the Mississippian house. The broken edge of the artifact shows evidence of reuse as a hafted scraper. This artifact belongs to the Woodland Period, but was reused in the Mississippian Period for scraping. This point was associated in the pit fill with a Naylor point from the Mississippian Period. Length = 3.3 cm, Width = 2.6 cm, Thickness = 0.9 cm, and Weight = 9.2 grams. Steuben Expanded Stemmed point (Specimen 81-2033-226-2) discovered immediately outside of the west wall of the Mississippian house in excavation unit N112 E82. This artifact belongs to a stone tool category that is usually dated to the Middle Woodland and Late Woodland Periods (500 BC to AD 800). Length = 6.9 cm, Width = 2.8 cm, and Thickness 1.0 cm. Marshall Point (Specimen 811-2033-198-1) discovered in the extreme southwest corner of the burnt Mississippian house in excavation unit N108 E90. This artifact belongs to the Woodland Period. It was being reused in the Mississippian Period for cutting and sawing. Length = 5.8 cm, Width = 4.4 cm, Thickness = 0.8 cm. Late Woodland Period cordmarked rimsherd (Specimen 81-2033-126-171) belonging to a large jar that was discovered in the fill of a trashpit situated over 100 meters south of the burnt Mississippian house. Rim thickness = 0.6 cm and Body thickness = 0.8 cm. 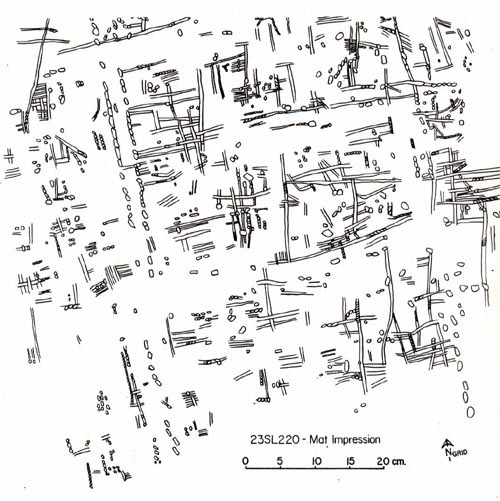 Distribution map of pottery sherds on the floor of the Mississippian House at Thornhill. Two small arrowpoints from Square 110 E86 in the north half of the fill of a trashpit against the west wall of the Mississippian house. 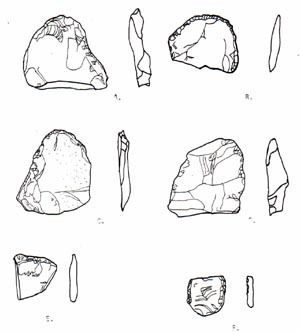 The more intact point was made by minimal retouching of a chert flake; it resembles Naylor Points from Southeast Missouri and Wanda Points from the FAI-270 report on the Range Site in Illinois. The Wanda points are associated with the Dohack Phase (Emergent Mississippian, ca. AD 800 - 850) at the Range Site. 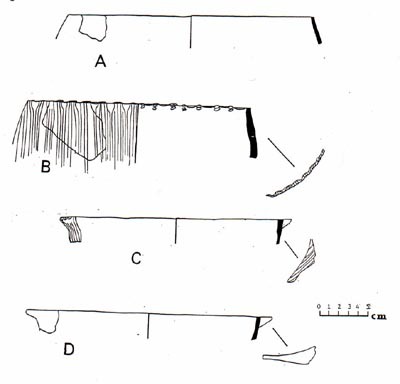 The more fragmentary point (the surviving haft element of an arrowpoint) resembles the Scallorn Point type found throughout Missouri and the Koster Point type from the FAI-270 report on the Range Site in Illinois. 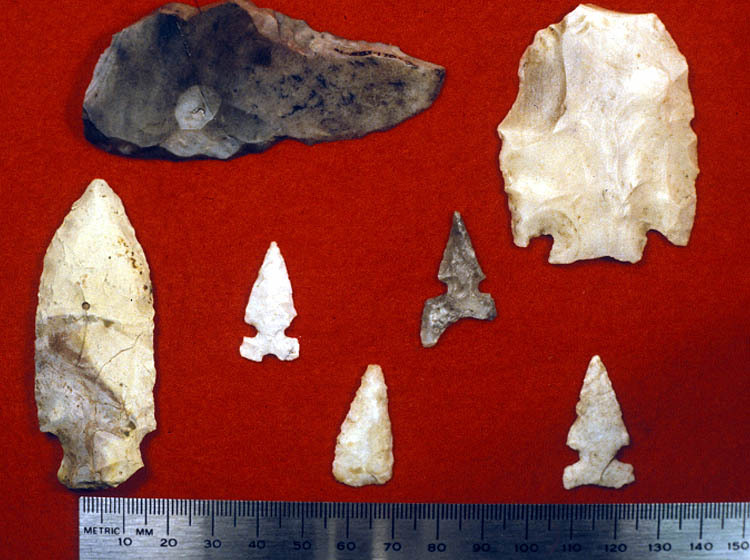 The Koster points were associated with the Emergent Mississippian features at the Range Site. The Naylor point measures Length = 1.7 cm, Width = 1.1 cm, Thickness = 0.4 cm, and Weight = 0.4 grams. Arrowpoint (Specimen 81-2033-6/3-272-1) from Square 110 E84 in the north half of the fill of a trashpit feature F against the west wall of the Mississippian house. 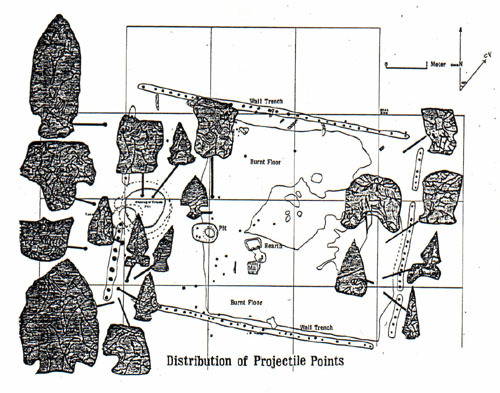 The arrowpoint was made by minimal retouching of a chert flake; it resembles Naylor Points from Southeast Missouri and Wanda Points from the FAI-270 report on the Range Site in Illinois. The Wanda points are associated with the Dohack Phase (Emergent Mississippian, ca. AD 800 - 850) at the Range Site. Length = 2.4 cm, Width = 1.45 cm, Thickness = 0.28 cm, and Weight = 0.5 grams. Arrowpoint (Specimen 81-2033-228-3) missing its base from excavation unit N108 E88. This point was found in the interior of the southwest corner of the Mississippian house. This point was part of an association of six arrowpoints (4 Naylor points, 1 Mississippian triangular, and 1 Cahokia 3 notched). They may have been part of a quiver of four arrows hanging in the rafters of the house. The point is not burnt. Length = 2.2 cm, Width = 1.25 cm, Thickness = 0.33 cm, and Weight = 0.7 grams. Cahokia notched arrowpoint (Specimen 81-2033-253-5) from the interior of the southwest corner of the Mississippian house. This point was part of an association of six arrowpoints (4 Naylor points, 1 Mississippian triangular, and 1 Cahokia 3 notched). They may have been part of a quiver of four arrows hanging in the rafters of the house. The point is not burnt. Length = 2.65 cm, Width = 1.32 cm, Thickness = 0.3 cm, and Weight = 0.6 grams. Cahokia notched arrowpoint (Specimen 81-2033-17-1) with a mis-shapened barb from the southeast corner of the Mississippian house. This point was part of an association of three arrowpoints (1 Mississippian triangular, 1 Scallorn, and 1 Cahokia 3 notched) that may represent a quiver of three arrows hanging in the rafters of the house. The point is a gray chert that may have been affected by heat/fire. Length = 2.92 cm, Width = 1.77 cm, Thickness = 0.35 cm. Arrow point (Specimen 81-2033-169-2) with a narrow, needle-like outline that can be classified as a Scallorn-variant. Found in the southeast interior corner of the Mississippian house in direct association with a Cahokia 3 notched arrowpoint and a Mississippian triangular arrowpoint. The narrow and long blade of this arrowpoint resembles a Washita chaffee (specimen Spiro-PbB1-1) illustrated from the Mississippi Period occupation at Spiro Mounds in Oklahoma. It is a very uncommon point type at Spiro. Length = 2.9 cm, Width = 0.9 cm, and Thickness = 0.4 cm. Mississippian triangular point (Specimen 81-2033-183-2) found in the southeast interior corner of the Mississippian house. It was in direct association with a Cahokia 3 notched arrowpoint and a Scallorn-variant arrowpoint. Length = 2.8 cm, Width = 1.4 cm and Thickness = 0.4 cm. 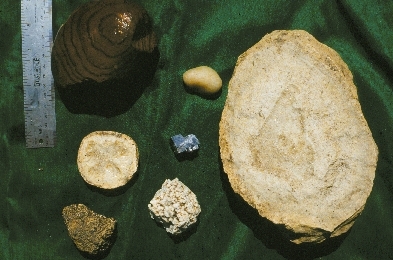 Three pieces of chert (Specimens 81-2033-186-3, 81-2033-186-4, and 81-2033-186-2) belonging to a single core of Crescent Quarry chert. 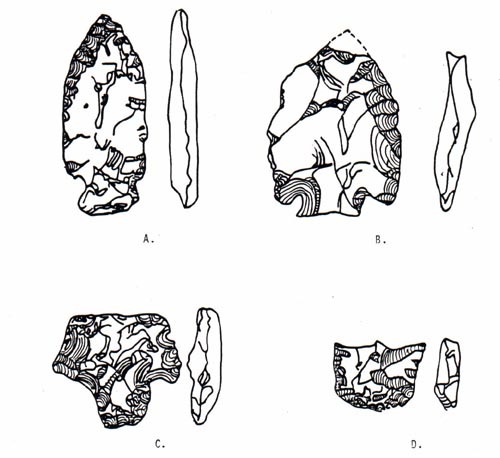 These pieces were found as an association of four chert pieces in the southwest interior corner of the Mississippian house. 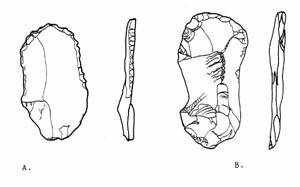 Specimen 81-2033-186-3 is an intentional blade while the other pieces are flakes that were intended for flaking into Naylor or Scallorn points. Large flake of Crescent Quarry chert (Specimen 81-2033-186-1) belonging to an association of four chert pieces in the southwest interior corner of the Mississippian house. The flake had been cached for future retouch flaking into a Naylor point or Scallorn point. Unifacially flaked denticulate end scraper from excavation unit N114 E84 (Specimen 81-2033-275-2) found in the fill within the north wall trench of the Mississippian house. The working edge of the tool has been retouched by unifacial flakes. Length = 6.7 cm, Width = 3.4 cm, Thickness = 0.9 cm, and Weight = 18.5 grams. End scrapers found inside the Mississippian house. Flake scrapers associated with the Mississippian house. 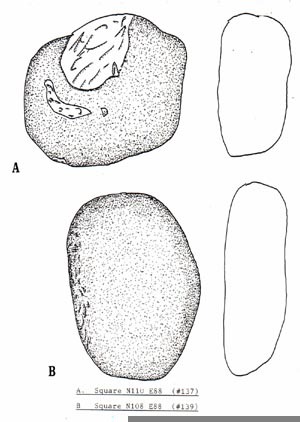 Hammerstones found inside the Mississippian house. Crescent Quarry chert cores found in association with the Mississippian house. 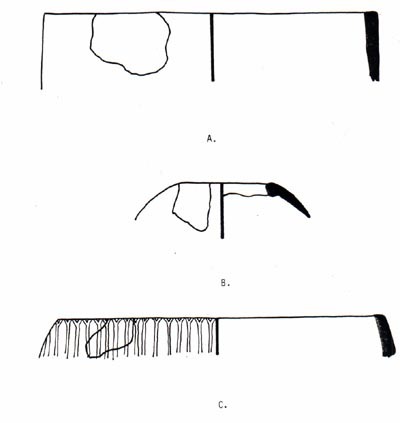 Four awl-like tools found inside and outside of the Mississippian house. 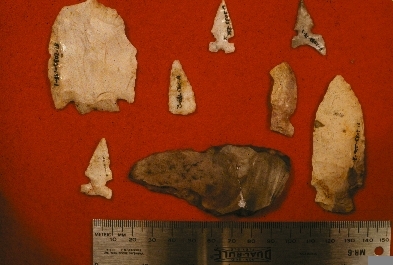 Pick-like chert tools found inside the wall trench fill of the Mississippian house. Cahokia Cordmarked rimsherd (Specimen 81-2033-292-2) from an intrusive cylindrical pit feature along the west wall of the Mississippian House. Handle attachments are visible on the rim and shoulder. Voids left by leached particles of shell indicate that it was tempered with both large and fine particles. This is the only example of this ware type from the site and indicates that some kind of activity at the site continued until approximately AD 1100 to 1400. Rim Thickness = 0.7 cm and Body Thickness = 0.6 cm. 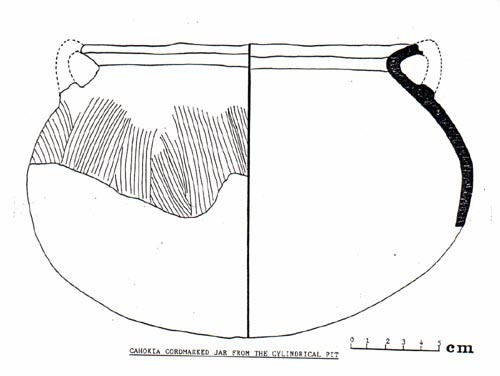 Cahokia Cordmarked rimsherd (specimen 81-2033-292-2) from the instrusive cylindrical pit features along the west wall of the Mississippian House. Three shell and limestone tempered bowls from the interior of the Mississippian house at Thornhill. Rimsherd A (Specimen 81-2033-222) is decorated with S cordmarking and came from excavation unit N110 E84. Rimsherd B (Specimen 81-2033-186-2) came from excavation unit N108 E84. Rimsherd C (Specimen 81-2033-166) has a light pinkish slip on its interior surface. It was discovered under the mass of carbonized corn in the southeast corner of the Mississippian house. Rimsherd belonging to a hemispherical bowl (specimen 81-2033-36-1) with cordmarked exterior. The vessel was tempered with limestone and grit. 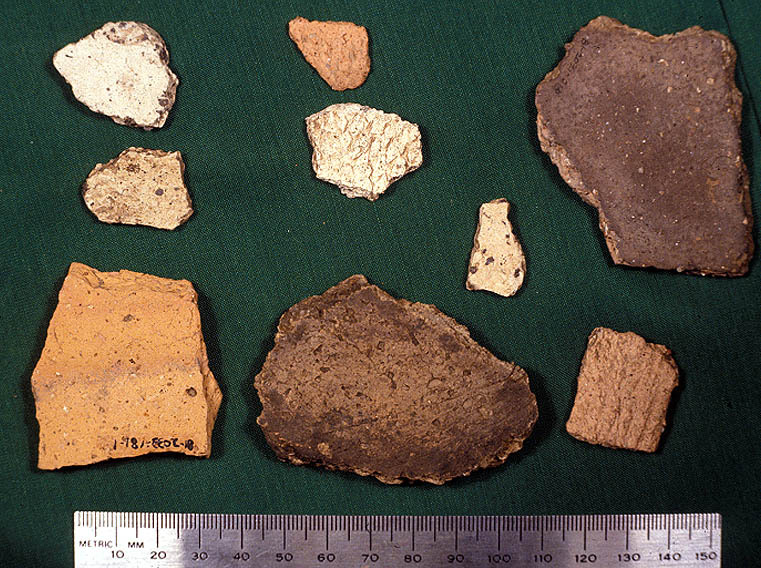 Four grit and grog tempered sherds from inside the Mississippian House. Rimsherd A (specimen 81-2033-170) is an whole mouth jar or bowl with light red slip; found in excavation unt N112 E88. 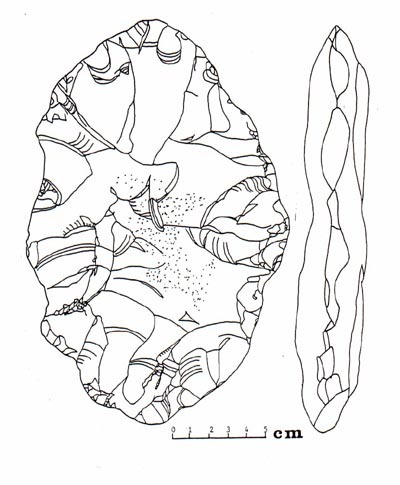 Rimsherd B (specimen 81-2033-175-1) is from a cordmarked and rim impressed jar or bowl found in excavation unit N08 E88. Rimsherd C (specimen 81-2033-10-2) is from a bowl with S cordmarking found in excavation square N110 E90. Rimshrd D (specimen 81-2033-145) found in excavation unit N110 E86. Three rimsherds from inside the Mississippian House at Thornhill. 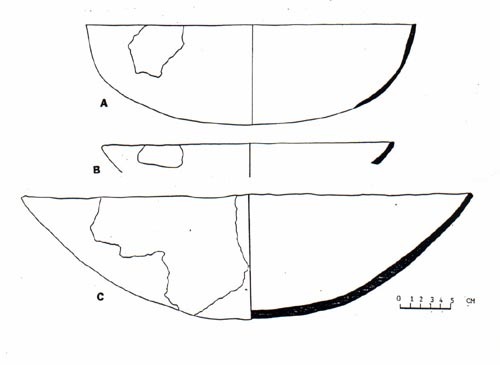 Rimsherd A (specimen 81-2033-301-11) is from a beaker or straight wall bowl found in excavation unit N108 E84. Rimsherd B (specimen 81-2033-186-3) is a seed jar that was built into an elevated clay bench in the southeast corner of the house. It was discovered in excavation unit N108 E84. Rimsherd C (specimen 81-2033-301-2) was discovered built into the elevated clay bench in the southeast corner of the house. It was decorated with vertically oriented cordmarkings. 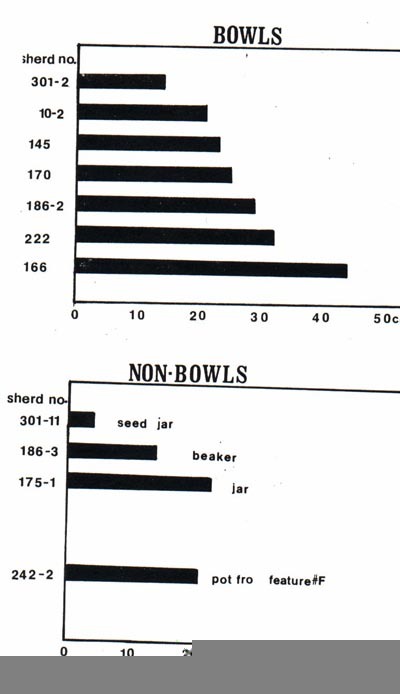 Comparison of rim diameters for bowl and other pottery forms from the interior of the Mississippian House at Thornhill. Cache of odd rocks or shaman's bundle? Galena, banded pebbles and crystals found in a cache in the interior of the Mississippian Period house at Thornhill. Cache of odd rocks or shaman's bundle. Carbonized remains of a basket found crushed on the floor of the Mississippian Period house at Thornhill. 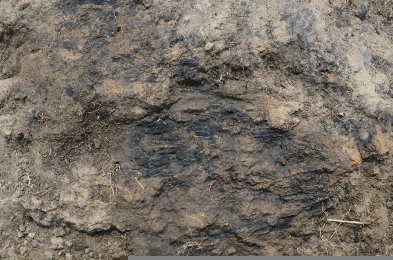 Pattern of a carbonized mat that was discovered partially embedded into the clay floor of the Mississippian house at Thornhill. Fist-size piece of daub with impressions of reeds from the Mississippian house at Thornhill. Two fist-size pieces of daub with impressions of reeds from the Mississippian house at Thornhill. Thick bifacially flaked chert tool/preform discovered in a test trench weste of the Mississippian house. The raw material is a gray chert that is not local. 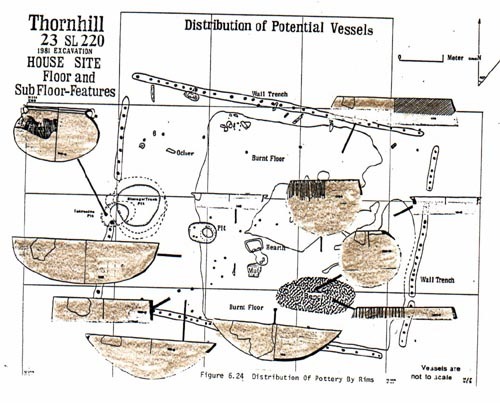 This website is based upon Thornhill: An Emergent Mississippian Farmstead in St. Louis County by Neathery Batsell (Fuller) submitted as her Masters Thesis to the Department of Anthropology, Washington University, during 1985. The text was adapted for the web by Professor Michael Fuller (SLCC). The website architecture is the design of Neathery B. Fuller (Adjunct Professor of Anthropology at SLCC).